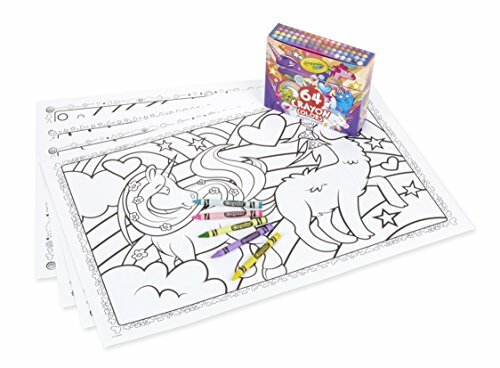 Unicorn coloring set: bring home a custom 64ct crayon box and 24 Supersized unicorn coloring pages, each 12.75" X 19.5". Custom crayon box: Your child will love the custom 64ct crayon featured in this set, which includes dazzling unicorn artwork on the box. Unicorns & friends: in addition to wonderfully detailed unicorn coloring pages, kids will enjoy discovering a mix of never-before-seen creatures. Gifts for kids: a great coloring gift for girls and boys! Unicorn coloring books: This pairs perfectly with the Crayola uni-creatures coloring book (sold separately).